Order Change Places With Me Here! Learn More About Lois Metzger Here! "From Lois Metzger, acclaimed author of A Trick of the Light, comes a work of speculative fiction set in the near future about a teen girl who finds a new, mysterious perspective on her life. But something still feels wrong to Rose. Because, until very recently, Rose was an entirely different person—a person who is still there inside her, just beneath the thinnest layer of skin. 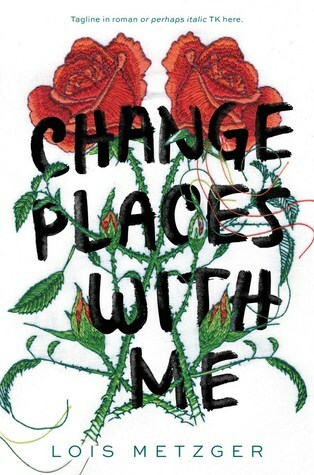 A bold and original work of speculative fiction set in a familiar future, Lois Metzger’s latest novel is a profoundly authentic and heartbreaking tale of the things we keep locked away inside us, even from ourselves." I am looking forward to so many things, about this book and beyond the story of the book itself. For the sake of my gigantic blog tour post that will be coming in March, I do not want to say TOO much about what I am looking forward to or what I am planning for the tour, at least not yet. I CAN say however, that I am very excited to see mental illness represented (and the "focus") of the story. Stories with mental illness involved and represented well are very, very rare, and it is sad that I even have to say this. But, I am extremely happy that mental illness and the stigma against it is being brought into the spotlight. I am kind of shocked that I had not heard of this book through other mediums. From what I know about the author, her works seem to be very, very popular! However, I am so excited that I stumbled upon this upcoming release of hers! I am hoping to go to my local bookstore soon and see if I can find her other works as well. I have not read any of the author's works before! It seems like 2016 will be a great year for me in terms of reading "new-to-me" authors! Personally, I love the cover and the title. I think the title brings a lot of questions to the story based on what I know from the synopsis. Why would she want someone to change places with her if she is bursting with happiness? Is it because she is not familiar with those feelings? Is Rose the one that made this title? Which "side" - happy or depressed - does this title refer to? Which "side" is saying this, if it even really is Rose? Depending on how you interpret the title, there are tons of different answers that can be reached. I also love the cover of the book. A white cover (at least on my bookshelf) is not very common on my bookshelf, so I will be very happy to add this to my rainbow of books. I also think it is very interesting to have two roses on the cover. While Rose is the name of the main character, the synopsis along with the cover itself remind me of the phrase "Every rose has a thorn". I think this embodies Rose herself, because she is now confronted with two very different sides to herself and her personality emotionally. It is up to her to decide which side is the rose, and which one is the thorn. While it may seem obvious to us, it might not be so obvious to Rose. However, in this scenario, any wait is too long of a wait to read this kind of book. There should be amble amounts of YA books that focus on mental illness (that are relatively current, too) that I can choose from. I shouldn't have to wait at all to see representation. I am very excited to read Rose's story and to step into her shoes, and even happier to be planning something that could very well change the way that you see mental illness. That being said (shameless self-promotion here), if you or someone you know has a mental illness or deals with the effect of it, and would not mind writing something for a blog post, can you email/tweet me? Even if you don't have a mental illness, or you just want the stigma against it to end, you can participate as well. I can send additional information if you would like and you would be credited (and linked, if you have a blog) for your words! I was really hoping that I would never have to make this post in my entire blogging career. While that incident was horrible and downright inexplicable in it's own realm, this next issue is also just as important. Bloggers are plagiarizing other bloggers. As sad as this is to say, this has been happening for a long time, even in just the short year and a half that I have been blogging here at I Turn the Pages. I've seen tweets about bloggers who have had their content stolen. I have read very similar - if not completely identical - Goodreads reviews for books. I have even seen a website where another blogger took pieces of reviews from several bloggers and pieced it together as if nothing was wrong. I thought this whole scandal would be over and done with by now, especially after the blogging community essentially shut down a blog that had been plagiarizing reviews since it's birth. But, yet again, I see myself reminded that these plagiarisms still take place. As bloggers, we work very, very hard to post consistently to our blogs, to interact with subscribers, viewers and otherwise. Thankfully, the one thing we don't have to work hard for as bloggers as finding the connection to something that we love. But, a lot of what the general public (and sometimes, even other bloggers) don't consider is that effort goes into every single piece of the website. It took me hours and hours to decide to use the font that you are reading right now on the blog, along with the size of the font and the layout of my posts, not to mention the time I spent crafting this particular one. To see something that we have all worked so hard for - to see something that we have quite literally poured our hearts into - be copy-pasted onto another blog by a few simple clicks is an indescribable event. Thankfully, I have not been plagiarized (at least, to my knowledge), but I can only imagine it feels like someone is ripping your heart out of your chest. Blogging isn't just something that we do passively. We put a ton of work into it every single day, even if you don't see us posting all of the time. Hannah from The Irish Banana Review works with publishers to put together blog tours to promote the book way before it is even released. Nori from ReadWriteLove28 puts together a Sunday Street Team for the same purpose. Brittany from The Book Addict's Guide took her love for books and turned it into an Etsy Candle Shop. Our blogging isn't just about our blog, it is about the people that we meet and love. But, when you take content away from us, and claim it as your own, it is crossing a line. It is definitely one thing to have similar feelings about a certain character in a book, but it is another to copy a review word for word or even paraphrase it. I really don't know what other way to put this, but I felt I needed to write a blog post because I needed to get my voice out there, to have my voice heard, and maybe, just maybe it would force these bloggers and other individuals to reconsider their actions and remedy the situation. I know that it can be scary entering a community, or even if you are not new, just to be a part of it. I know that sometimes, inspiration for posts do not come easily, and you want to stick to a schedule as much as you can. I know that sometimes, you can't help but be addicted to the numbers game, and do anything that you can to ensure those numbers keep rising. But plagiarism is not the answer. If you need help coming up with ideas for blog posts, or even need someone to bounce them off of, I'm sure I speak for several book bloggers in the community when I say you can come to us. You can come to me. You can email me, or tweet me, or even Facebook message my page if you have to. I am more than willing to help you come up with your own creative and unique posts. There are other options than plagiarism. If you need some ideas for posts, you can also talk to me and I will include you in some of my tags or features. (By the way, you don't have to be officially tagged in my tag posts to participate). We can even come up with a joint feature together if you would like. You don't have to plagiarize. You shouldn't. I mentioned this on Twitter, but I will mention this here again. Blogging is a numbers game. Blogging is not about followers or views or other blog statistics. Blogging is about connecting with something that you love, and sharing that passion with others. Your blog may be about books like mine, or it may not be. Your blog could be about makeup or animals or movies or anything that you are passionate about. Finding that spark - finding what you are passionate about, and what makes you, you - is what blogging is about. You have to be your own person to be successful. Do yourself a favor, along with others in the blogging community, and find a blogger that you really connect with. Maybe you enjoy reading their posts, seeing their pictures on Instagram, or you just like seeing them get excited about their favorite authors. TELL THEM. The best thing you can do for the blogging community right now, even if you are a part of it, is to support everyone. It's not easy dealing with plagiarism, but you can let them know that you support them in everything that they do. Plagiarism is not acceptable, and we have to be the ones to send that message. We can still be a loving, fun, accepting community. We don't have to let this knock us down either. Do you know what that means? I can finally start my Winter Wonderland Feature! If you are not sure what this is, or you need a refresher on the guidelines for the tag, you can click HERE to be taken to the rules page, where I explain the procedure of what to do once you get tagged, or if you want to start the tag on your own blog! The character I picked today is Natasha Romanova from the Marvel Cinematic Universe, the comics, and of course, Margaret Stohl's Black Widow: Forever Red. Now, don't get me wrong, Natasha Romanova has tons of different characterization in all of the movies. In Margaret Stohl's Black Widow: Forever Red and in The Avengers, we know Natasha from her line "Love is for Children". In The Avengers: Age of Ultron, we see a more romantic and caring side to Natasha, and in Captain America: The Winter Solider, we see her friendship blossom with Steve Rogers (aka Captain America). All of these Natasha's are still the same person, and I do not think it is as much of a lack of consistent writing as it is a piece of who Natasha is as a person now. But, that's a post for another time. For this post, I'm going to be looking at my version of Natasha, which can be a combination of all of these things. Natasha, originally, did not understand the idea of Christmas or why it was so important. Being trained in the Red Room, and essentially, growing up there, the joy and cheer of Christmas time was never something she was exposed to. So, when the time first came around with her new team of Avengers, Natasha was out of the loop. However, her best friend Hawkeye helped her to discover what the true meaning of Christmas is, and what the fuss is all about. Clint buys matching ugly Christmas Sweaters for the pair and he wears his every day. The first time he gave Natasha a sweater, she didn't wear it - "Clint, you know I'm not into this." - but it grew on her, and by the week coming up to Christmas, it wasn't uncommon to see her wearing the sweater around the tower. But if Clint called her out on it - "Hey, Tasha, nice -" "Clint, I swear to God if you tell anyone else" - you were in trouble. I have more headcanons for this one, I just wanted to show you one of them! Natasha always saves her money all year to go and purchase presents for the children and families that can't afford them that year. The first year she does this, she buys a few Barbie tolls, a few toy trucks, and even a few Avengers action figures, all to be donated to a worthy cause. As the years go on, her contributions get bigger and bigger. She purchases Christmas Trees and Menorahs for families that can't afford them, and even starts early preparations for Eid with the local Muslim community. She makes the decision (or, in her mind, the "mistake") to bring Clint along on one of these shopping sprees. He fills the cart with bows and arrows, along with targets, because "Everyone loves Hawkeye!" He makes the occasion by bringing along Santa hats for the pair, forcing Natasha to wear hers throughout the store. (Secretly, Natasha loves it). It isn't long before Clint leaks this to Tony, and now the Avengers have a giant shopping spree in which they invite all children to come to the toy store, pick out whatever they would like, and purchase it all. Because I love Natasha so much, I'll likely be adding onto these headcanons throughout the month through several Winter Wonderland features, and even broadening this category to the Avengers. 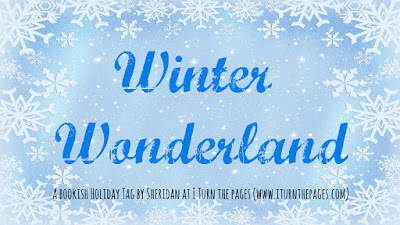 I hope to have enough posts for these so that a Winter Wonderland can happen every day the week leading up to Christmas! Now for the fun part. I get to tag who completes this challenge next. Have fun writing, and Happy Holidays!